With playfulness and absurdity, Meg Stein (b.1984) addresses complex issues of femininity, vulnerability, and human fragility. Her work takes the form of biomorphic sculptures and sculptural installations, as well as explorations in animation, performance, and participatory work. Not only do the sculptures themselves take on lush fleshy forms, the materials used to construct these embodied objects are also the very tools used in everyday rituals women practice – makeup applicator sponges, nylons, tampons, nail polish, and others. Each piece is abstract, whimsical, almost otherworldly and yet inherently still familiar. She veils the immediate identification of these found materials in nuanced ways. One such method is the act of whitewashing as if to indicate that is the precarious path to purity, innocence and other cornerstones of feminine virtue. Although her sculptures appear unstable and fragile, she painstakingly solves problems of structural stability to ensure each piece is steady in its final form. Stein received her MFA in 2014 and her BA in 2006 from the University of North Carolina in Chapel Hill, NC. 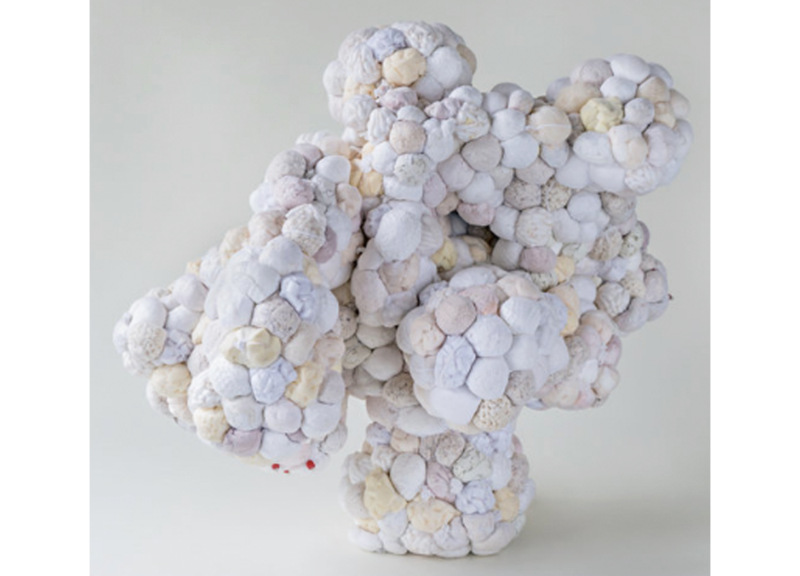 She has been awarded fellowships and residencies across the country, including the South Arts State Fellowship for NY in 2018, The Garland Fellowship at the Hambidge Center in Rabun Gap, GA in 2017 and residencies at Yaddo in Saratoga Springs NY, and the Virginia Center for the Creative Arts in Amherst, VA, among others. Her work has been featured in solo exhibitions in 2018 at the Neon Heater in Findlay OH and in 2016 at the Ground Floor Gallery in Nashville, TN and in 2015, at Carrack Modern Art in Durham, NC, as well as in several national group exhibitions. Reviews, interviews and talks have been presented in publications and panels in many forms. Stein currently lives and works in Durham, North Carolina.